Although widely known as the "capital of salsa", life in Cali is not always as untroubled and easy-going as the Afro-Caribbean music. Over recent years, economic progress has been remarkable in this south-western Colombian city. However, a fairly high number of residents have not been able to benefit from the region's upswing. Their daily lives remain marked by crippling poverty and despair. Cali is the third most populated city in Colombia and the capital of the "Valle del Cauca" department. Over the years, the city's economic importance has grown drastically and diversification efforts have paid off. A number of multinational companies have chosen Cali as their Colombian base. When it was opened in 2009, SOS Children's Village Cali became the 500th SOS Children's Village in the world. Although the city of Cali has undeniably seen substantial economic progress, many caleños face a life under extremely challenging conditions. Around 35,000 children from underprivileged families do not go to school. According to official reports, the number of children who work in the streets amounts to 43,000. 45 per cent of these working children have lost parental support either completely or come from a single-parent household. Begging, selling merchandise or cleaning car windshields at traffic junctions is what most of these children do in order to make a living. Instead of attending school, they find themselves forced to make money in order to bring home food for their family. It is not uncommon that children also work during night hours. A lack of education also means a lack of opportunities once these children become adults. Without an education, most of them will find themselves trapped in a vicious cycle of poverty that often leads to a life marked by crime and drug abuse. Poverty in Cali is not colour blind. 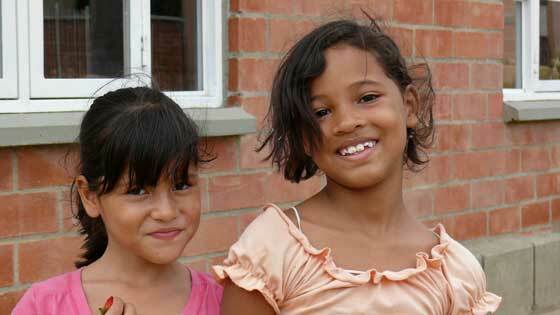 Caleños of Afro-Colombian descent are particularly affected by high levels of poverty in the region. In the Aguablanca district, a sea of tin shacks without access to running water and electricity marks the landscape. In such a harsh socioeconomic environment, a joyful childhood remains nothing but a dream for many of the city's youngest residents. 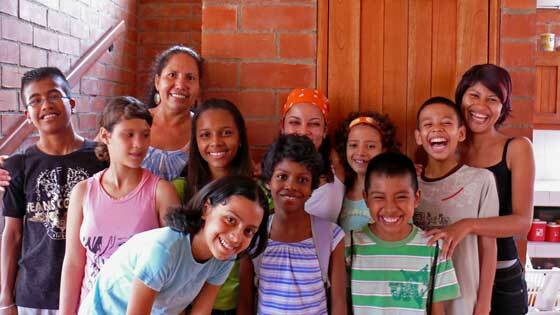 The work of our organisation in Colombia began in the 1970s. For many years, the country was heavily affected by the drug trade and a long-running civil war that has displaced tens of thousands of families all across Colombia. Many who used to live in rural areas of south-western Colombia were forced to leave their homes against their will and move to Cali. A large number of forcibly displaced Colombians from around Cali have lost everything and are now struggling to survive in an urban environment they are not familiar with. Although the government offers humanitarian assistance for a limited period of time, life for the displaced is extremely challenging. Displaced children often do not go to school and lack even the most basic needs. At SOS Children's Village Cali, our organisation has been assisting the local population with an integral package of services that includes a family strengthening programme, counselling and loving homes for children who grow up without parental support and protection. Strengthen families: Our SOS Social Centre includes child day-care opportunities for local families. The centre forms part of our SOS Family Strengthening Programme, which represents a comprehensive concept aiming to enable children who are at risk of losing parental care to grow up within their own family. Many young mothers who would otherwise not be able to raise their children have sought our support. They are now able to go to work and earn a living while their children are being looked after in our day-care centre. Care in SOS families: SOS Children's Village Cali comprises SOS families where up to 126 children who cannot live with their parents are cared for by SOS parents. Some families live in homes in the local community – they receive the same support from SOS Children’s Villages. Wherever possible, we work closely with the children’s family of origin, so that they can return to live with the families. Whenever this happens, we work towards supporting them during the period of change and adjustment.